Below are common attributes associated to Christmas Cactus. Become a care taker for Christmas Cactus! Below are member comments regarding how to plant Christmas Cactus. No comments have been posted regarding how to plant Christmas Cactus. Be the first! Do you know how to plant Christmas Cactus? Below are member comments regarding how to prune Christmas Cactus. No comments have been posted regarding how to prune Christmas Cactus. Be the first! Do you know how to prune Christmas Cactus? Below are member comments regarding how to fertilize Christmas Cactus. No comments have been posted regarding how to fertilize Christmas Cactus. Be the first! Do you know how to fertlize and water Christmas Cactus? Below are member comments regarding how to deal with Christmas Cactus's pests and problems. 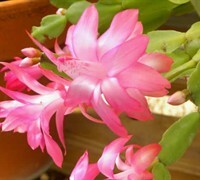 No comments have been posted regarding how to deal with Christmas Cactus's pests and problems. Be the first! Do you know how to deal with pests and problems with Christmas Cactus? In late October or early November, make an application of a 0-10-10 type liquid fertilizer. A second application of this fertilizer can be made in February. During the growing season from April through September, fertilize the plants with an all purpose liquid houseplant type fertilizer. The fertilizer you use should have a nitrogen ratio of no higher than 10 percent. Of the three numbers on a fertilizer container, the first number is nitrogen. The best time to pinch or prune a Christmas cactus for shaping is when the new growth begins in March or early April. One of the most frustrating things that can happen to Christmas cactus is after the flower buds have developed they drop off the plant. Bud drop can be caused by anyone of several different conditions. Usually it's because of over-watering, lack of humidity or insufficient light. Plant Christmas cactus in a light, professional potting mix. In September and October, Christmas cactus plants should be kept in a cool room where temperatures will remain around 50 degrees, give or take a few degrees. Be sure not to expose them to freezing temperatures. It's also very important they be kept in a room where no artificial light will be turned on at night. The key to getting Christmas cactus to flower during the holiday season, is the proper light exposure, correct temperatures and limited watering. So during the fall months, the Christmas cactus should be placed in a spot where it receives indoor indirect bright light during the daylight hours but total darkness at night. Christmas cactus require about 50 to 60 percent humidity. So it's a good practice to place a glass, vase or tray of water near the plant. As the water evaporates it will provide the humidity the cactus needs. A humidity tray is another method of providing the humidity the Christmas cactus requires. This is done by filling a waterproof saucer with gravel, then adding water halfway up the gravel. Place the pot on the gravel surface. The Christmas cactus should never be placed near a door that opens and closes to the outside. Likewise, keep it away from heating ducts or near the fireplace or drafty areas. After The Christmas holiday season, the Christmas cactus should be given about a 30 day rest. Again place it in a cool room and provide limited water. Don't worry if it loses a few leaves or joints and appears weak during this rest period. The best time for repotting a cactus is in February, March or April. However, keep in mind the plant will flower best if it's kept in a container where it's pot-bound. If your Christmas cactus is given proper care and is placed in the right location, it's not unusual for it to flower several times throughout the year.